Senior community members and a cross section of adults and care givers attended the 8th Annual Dr. Lemuel and Gloria Rogers African-American Health Symposium held on Thursday, March 8, 2019 at Mt. Olivet Baptist Church located at 141 Adams Street. Attendees were greeted by representatives from the Alzheimer’s Association, LifeSpan and several community health organizations that participated in the free forum to provide updated health information and support services in the areas of Hypertension and Diabetes, Dementia and Alzheimer’s Disease. Nutrition, early detection and caregiver support were at the top of the list of issues for most of the health disparities facing African Americans, Latinos and other ethnicities of color. As a way to begin the information session and segway into nutrition facts, the audience was treated to a delicious healthy meal from recipes contained in the free cook book provided by the Alzheimer’s Association that was prepared by Lorraine’s Food Factory. The health symposium was named after Dr. Lemuel and Gloria Rogers, members of Mt. Olivet Baptist Church, who envisioned a forum to share health information with communities that are hardest hit by health disparities of Hypertension and Alzheimer’s. 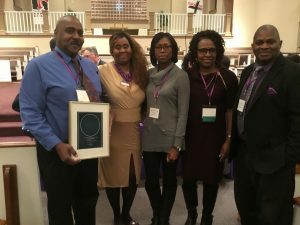 Lemuel (Lem) Rogers, Jr., son of Dr. Lemuel & Gloria Rogers, was presented with a special photograph of the starry night on which he was born from the Alzheimer’s Association in memory of his parents. Lemuel was touched emotionally as he shared the contributions of his parents and experiencing being a caregiver of the affect that Alzheimer’s had on their lives. Family caretakers are increasingly becoming the norm to assist or provide full-time, in-home care for immediate family members exhibiting signs of dementia or degenerative cognitive conditions as a result of Alzheimer’s. Richard and Vielka Gause shared their unexpected experience with Vielka’s mother who suffered a heart attack while living alone. Gause is a football coach at Bishop Kearny High School. He felt that it was imperative that he supported his wife in caring for his mother-in-law directly in their home. “My mother-in-law was a vibrant and active person. Once we discovered the impact of her condition it was immediately determined that she would come to live with me and my wife in order to give her the care and attention that we wanted her to have. This put my wife’s and my mind at ease to know that ’we could be there for mom’ as the disease was decreasing her ability to live alone,” he said. – More people are living with dementia: An estimated 5.8 million Americans have Alzheimer’s dementia in 2019 – this number does not include other types of dementia. By 2050, this number is projected to rise to nearly 14 million. – Usually, Alzheimer’s is the most common type of dementia and accounts for 80% of all dementia cases, which means a few more millions of Americans are living with other types of dementia. – More women than men have Alzheimer’s or another dementia. – Two-thirds of Americans with Alzheimer’s are women of the 5.6 million people, age 65 or older within the United States, 3.5 million are women and 2.1 are men. – Older African-Americans and Hispanics are more likely, on a per-capita basis, than older whites to have Alzheimer’s or other dementias. 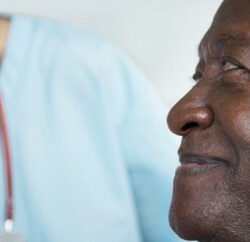 Older African-Americans are about twice as likely to have Alzheimer’s or other dementias as older whites, and Hispanics are about one and one-half times as likely, though recent studies suggest the increased likelihood for Hispanics may be slightly lower than this, depending upon the specific Hispanic ethnic group observed (for example, Mexican Americans compared with Caribbean Americans). Variations in health, lifestyle and socioeconomic risk factors across racial groups, likely account for most of the differences in risk of Alzheimer’s and other dementias by race. There is also evidence that missed diagnoses of Alzheimer’s and other dementias are more common among older African-Americans and Hispanics than among older whites. – In 2018, caregivers of people with Alzheimer’s or other dementias provided an estimated 18.5 billion hours of unpaid assistance, a contribution to the nation valued at $234 billion. – 83% of the help provided to older adults in the United States comes from family members, friends or other unpaid caregivers. – A “Special Report” reveals an important disconnect: despite strong belief among seniors that cognitive assessments are important and that early detection is beneficial, only half are being assessed for cognitive decline, and just one in seven seniors (16%) receive regular assessments for memory or thinking issues during routine health checkups, compared to other common evaluations like cholesterol (83%), hearing or vision (73%), and diabetes (66%). – Nearly all primary care physicians (PCPs) (94%) consider it important to assess all patients age 65+ for cognitive impairment, fewer than half (47%) say it is their standard protocol. – Seniors are experiencing changes in their cognitive abilities, but not bringing up this matter with their doctors. The survey found that half of all seniors (51%) are aware of changes in their cognitive abilities, including changes in their ability to think understand or remember, but only four in 10 (40%) of these seniors have discussed these concerns with a healthcare professional. Fewer than one in seven seniors (15%) report having ever brought up cognitive concerns on their own. “Alzheimer’s impacts our community disproportionately. We should be aware of the symptoms and preventative actions we can take this debilitating disease does not devastate all of us and our families. Do it for those that you love, especially your children because we have no idea when we will find a cure. Do it for yourself,” said Lois Williams, Norman. For more information on Alzheimer’s disease and support resources call 800-272-3900 or visit online at www.alz.org/rochesterny. Note: A portion of the information provided by reports submitted to the Alzheimer’s Association.